This little quilt is four firsts for me. 1. It's my first mini quilt, measuring 16.5" square. 2. The first quilt I've made using my Flea Market Fancy fabrics. 3. The first hand quilted project I've finished. Emphasis on finished. 4. And, my first time to quilt with Pearl cotton. I used DMC size 8. I got most of the quilting done poolside last night while Shea was at swim team. I probably looked like a dork quilting beside the pool (in the shade of course) but, oh well. I thoroughly enjoyed myself. I really like quilting with the pearl cotton. It's quick and I love the look of the chunky stitches. I liked this little quilt last night when I finished it, but I love it this morning seeing it with fresh eyes. The quilting doesn't look as bad (crooked and uneven) as it seemed to me last night. I can't wait to hang this in my sewing room in the next house. There's something about it that makes me smile. I think it's the happy colors! And, yes, the Flea Market Fancy is even better out of the stacks! That is so cute. I've been hand quilting with the perle and it's just gorgeous - I had as much fun just rummaging through the drawers of colours in the shop - I wanted to take the whole lot home - drawers, perles, the lot! It is lovely! A great use for your FMR. I love the quilting, too. Wow, that is gorgeous work! I love the color composition, but the hand quilting is like icing on the cake. Great job! I never really "got" mini quilts before, but as a wall hanging... that's perfect! Filing that perspective away for future project. Such a very pretty -- and happy -- quilt. It makes me smile, too. Spectacular!! I too have never made a mini quilt or hand quilted anything. Very inspiring once again, thank you! Truly lovely! I adore the handquilting. I love it! So sparkly and fresh! fantastic idea!! Gasp! I LOVE THIS!!! I love how you made each star one colorway, and the quilting is just perfect. This is so cute! I just love the bright colors against the white, and the hand quilting adds the perfect touch. I'm planning on quilting my sunshine quilt with perle cotton, so thanks for showing me what the size 8 looked like! I can't decide between 8 and 5, as I really want the quilting to show, but I don't want to give myself a really hard time. Any thoughts on quilting with the size 8? The FMF looks great! I was never that struck by the fabrics, but they look so lovely all put together like that! This is absolutely amazing! It's adorable!! And your hand quilting is fabulous! 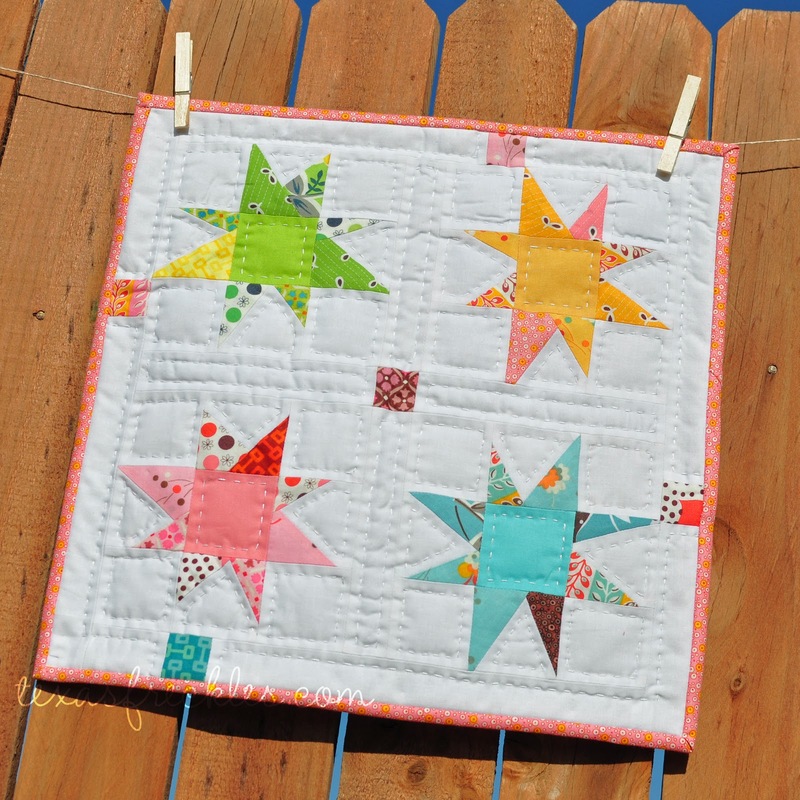 This is so cute - I love the colours and your hand quilting is SO perfect - well done! Trabalho com muita imaginação e muito bonito.Parabéns. This is so cute (and finished--bonus!!). Congrats for getting up the nerve to cut into your fave fabric. I'm making a mini now and planning to hand quilt it with Baptist fans--that will be a first for me. I like perle cotton too as it suits my still underdeveloped skills with it's prim look. Love your mini! I have been thinking of making one. Did you use a pattern? Love your stars! I can picture you enjoying your fabulous mini everyday in your sewing room. It is beautiful. Enjoy! What a lovely little quilt. Dont feel like a dork sewing at the swimming....I travel a lot for work and often sit on the train stitching away - I get a few odd looks but who cares!! it's really lovely! thanks for the info too. This is so darned cute! I hope some of those yummy fabs made it into your hexies!!?? Love your little quilt! It is so bright and fresh! Congratulations on your firsts!! This is such a cute quilt! Why don't I make more minis? Congratulation! May it be the first of many! How charming, I love everything about it; how perfect is that quilting! very nice indeed. 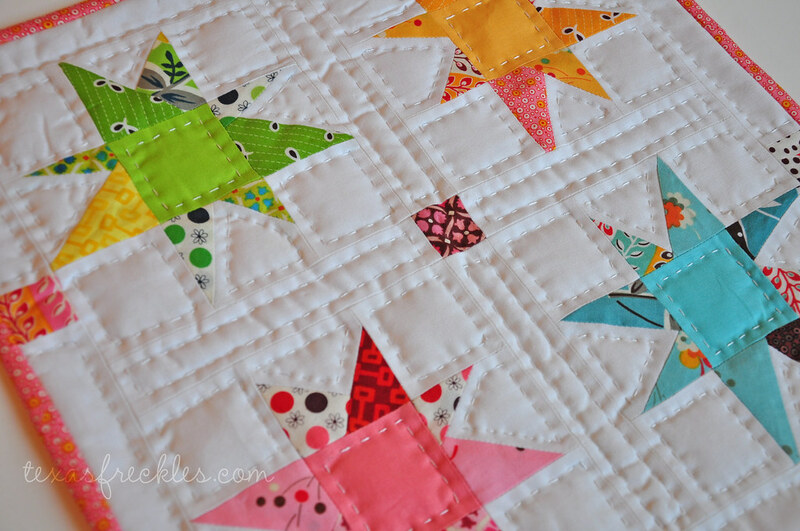 I love the crisp white and the fun colors on your stars. Wonderful first dip into your flea market fancy. Congratulations on all your firsts , what a fantastic little quilt ! really, really cute! 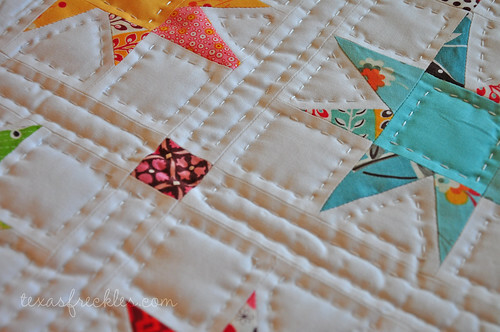 love the addition of the hand quilting, as well as those cute little randomly placed squares. It is just lovely. You did a great job on all of it. I ♥ it! Though, I'm completely jealous, as I don't own any FMF. ;) Was there a pattern/tutorial that you followed for your stars?